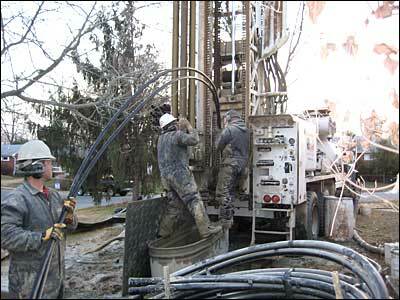 In this picture the workmen are running the geothermal vertical loop tubing into the finished wells. The length of ground loop tubing depends on the size of the house. We have a three bedroom single family house and needed a 3.0 ton system (that's the amount of air moved, the heat pump doesn't weigh three tons). To have enough contact with the ground we needed two wells drilled and each well was 300 feet deep. The geothermal loop sizing is calculated based on the square feet of house you need to heat/cool. It took about a day and a half to finish drilling the wells and about 30 minutes to run the geothermal vertical loop tubing. You can see that one guy feeds the ground loop tubing into the well (the actual opening on the well is only about 6 to 12 inches in diameter). The other guy guides the tubing off a large spool. Geothermal loop sizing needs to be done carefully. If the amount loop is sized too small then there won't be enough fluid moving through the tubes to heat or cool the home. If the geothermal vertical loop is too large that can also be a problem, primarily with cooling (in addition to costing more to install). As I understand it system that is too large can cool without adequately dehumidifying.